I did quite a bit more flying this summer than I did rc car racing. As the weather turns cold flying will be limited to golf dome outings with the local electric club and indoor FPV. 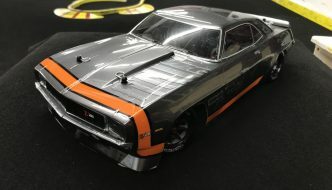 In Minnesota the on-road guys drive on carpet indoors, so it’ll soon be time to race. One thing I’ve grown to like that is commonplace on quads and planes is the XT-60 connector. So I decided to upgrade all of my cars and even my rocket launcher to it. Technically, an XT-60 pair is 2g heavier than a pair of Deans connectors, but with all of the other advantages, I’m still switching. They’re easier to solder, given the half-cup ends. You’ll get better contact than a flat pad and it will better accommodate larger, lower-gauge wires. 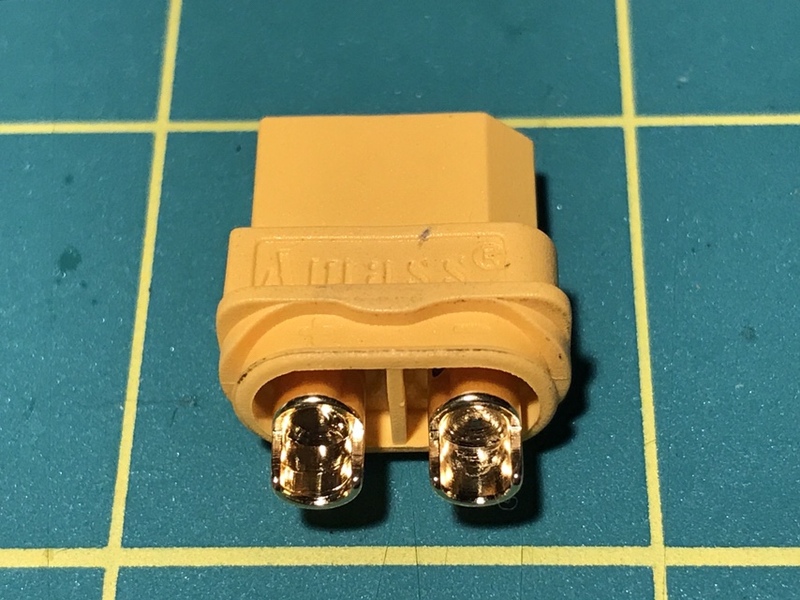 I have a mish-mash of genuine Deans connectors and compatible T-connector copies. The range includes some good ones that include extra grips down to the downright terrible Hobbico “Star” plugs. 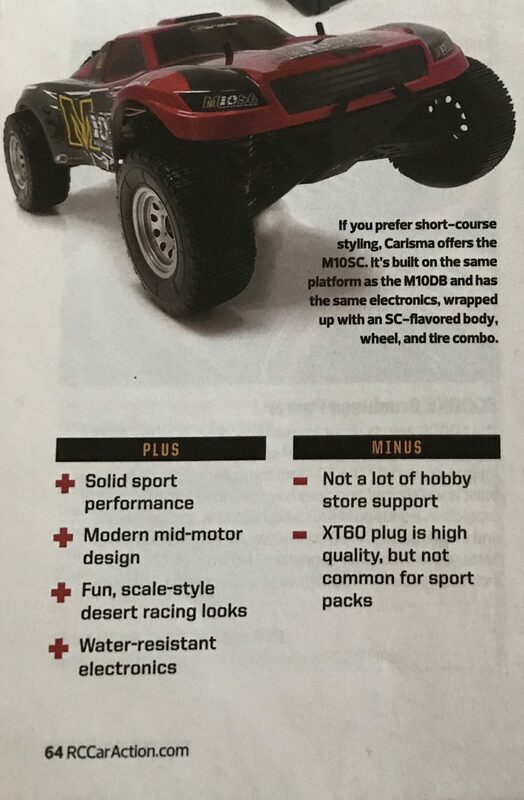 I read a review in RC Car Action of the Carisma M10DB – a brand that isn’t (yet) popular in the US. 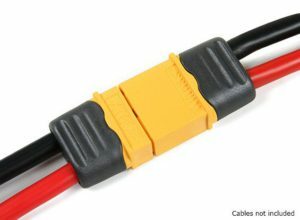 Strangely they cited it’s included XT-60 connector as a minus – albeit for its current uncommon use in R/C car batteries. Let’s change that! This is the best part. Almost all of my batteries now use either an XT-60 connector or a JST RCY connector (for smaller batteries). I may even switch those JSTs to XT-30 some day. But the lion’s share is XT-60. With less connector types, I get a simpler charging setup, and greater interchangeability between models. I can use my iSDT pocket charger on all of them, which gets power from this compact 10A adapter from Ready Made RC. It has XT-60 connectors for both input and output. It can be powered by 7-32v so you can hook up a high-capacity LiPo for input, like the one I use for my lawn mower, to do field charging. The charger is super portable and leaves my 4-button chargers in the dust. The RMRC 10A power supply falls a little short when charging my 5200mAh 6S lawn mower batteries, so I can only charge them at 3 Amps (because of the high 6S voltage). But it can charge most of my other batteries at their stated full charge rate. Car guys, if you haven’t heard of XT60 connectors and iSDT chargers you’re missing out.